by screening for the 'Can Do' and 'Will Do' that shape new hire performance. HirePayoff™ is a leader in creating candidate screening, assessment, and selection solutions that drive the bottom line. HirePayoff™ helps employers evaluate and make the best predictions about a candidate's future performance, potential, and engagement. The focus - accuracy, efficiency, and risk management... all aimed at gaining a payoff with every new hire. "The premise is simple: nothing can build a company, help it grow, or sink it, as much as its recruiting and hiring decisions. Few decisions an executive and his or her team make can pay off—or cost—as much as their hiring decisions." Written by David Jones, PhD, founder of Growth Ventures, Inc. and HirePayoff™, Million Dollar Hire shows how to link hiring decisions to bottom line results. Jones draws on decades of experience to highlight real-world hiring systems... ones that produce higher sales, stronger customer service, lower turnover, higher production, and other payoffs that drive an organization's success. 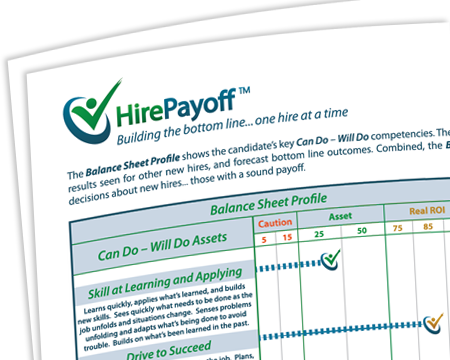 Million Dollar Hire lays out the strategies and tactics that drive HirePayoff™.